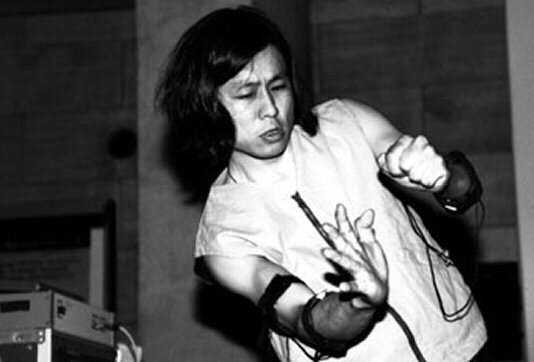 Sensorband is a musical project involving Edwin van der Heide, Atau Tanaka and Zbigniew Karkowski. It is characterized by the use of computers with devices such as bioelectric sensors, infrared and ultrasound used in order to transform the human body into a musical instrument. 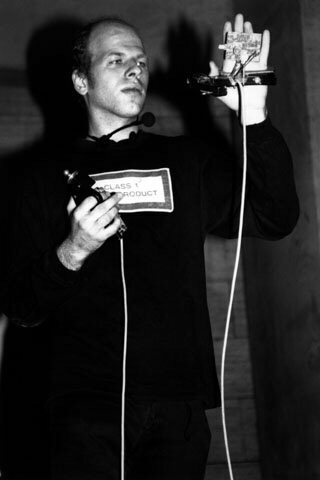 Premises – Historically, the project is linked to previous experiences by Michel Waisvisz, a pioneer in applying sensors for live music composition and performance. A prior model, may also be the Theremin and the Radio Baton by Max Mathews. All these experiences provide the benchmark for the Sensorband project. Brief history – Sensorband project born in 1993. The initial idea, expressed at Son Image Berlin Festival by Edwin van der Heide, was concretised two months after, during the first public appearance at the festival Voyages Virtuels organized by Les Virtualistes of Paris. Midi Conductor – Each team member plays a specific instrument. Edwin van der Heide plays Midi Conductor, inspired by The Hands, a Waisvisz’s instrument. It is based on the use of ultrasonic signals and some sensors that are used to determine the distance between the hands, their inclination and rotation in space. The Midi Conductor is activated by the movement of the arms that cut the infrared mounted on a sort of cage that surrounds the performer.2 The instrument consists of two parts: for control and sound synthesis. The control part is properly called Midi Conductor, developed by Bert Bongers at Institute of Sonology in Utrecht and at STEIM, the research center of Amsterdam, specializing in the development of technological instruments. The Midi Conductor is equipped with sensors that measure the distance between the hands, their movement and rotation in space. Sound synthesis is assigned to a computer equipped with an Arile board DSP-96. The signal processor is a Motorola 96000 floating-point. The software was developed by the same van der Heide, who also uses an Apple Macintosh with Supercollider for real-time granular synthesis and looping random sample. BioMuse – Tanaka’s instrument is BioMuse: a system that records neural signals, translating electrical impulses into computer data. BioMuse was developed by Hugh Lusted and Ben Knapp of BioControl System at CCRMA at Stanford University, in collaboration with the Medical School and the Department of Electrical Engineering. Initially the project involved the construction of an instrument that was controlled through bioelectrical signals picked up by brain, skeletal muscles and eyeballs. To do this, BioMuse is supported by an electroencephalogram, electromyogram and electrooculogram. The signals recorded by these devices are converted into MIDI signals. In the specific case of Sensorband, Atau uses four electromyogram. Through these, records the electrical activity of muscles of upper limbs. Once converted, the computer data sent to a machine equipped with Max/Msp. Some patches developed by Atau shall provide control signals for the management of a MIDI synthesizer and an additional software that generates graphical content in real time. Karkowski’s instruments – Karkowski uses 32 infrared sensors divided into two groups: 16 to transmit and 16 to detect. The latter, records arms position and their movement. In this way we obtain voltage signals which are converted into MIDI signals through a device created by Vladimir Grafov. After conversion, the signals are sent to a computer equipped with Max/Msp, which is accompanied by the Digidesign Sample Cell II for sound synthesis. The whole system just described, was developed by Karkovski and Ulf Bilting in Sweden, in 1990. In the same year was presented for the first time at STEIM. Karkowski’s instruments is characterized by the generation of percussive sounds, while the Midi Conductor and BioMuse work more on timbre. Soundnet – In addition to personal instruments, the trio takes advantage by a kind of interactive structure. This is a large (11×11 meters) called Soundnet. The whole structure is woven through wires with a diameter of 16 mm. At the ends of the cables are positioned sensors that record tension and movement. 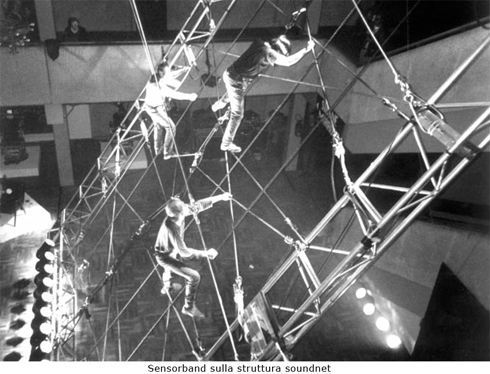 Sensorband “plays” the structure climbing. The computer data, managed through Max/Msp, control a DSP that filters and modified concrete sounds, creating a mix of natural sounds and technology. Network and music performance – Sensorband has also experimented the use of remote connection through an ISDN connection, to manage performance in a videoconference. The first concert of this type was organized in New York where played Atau and Van Der Heide. Meanwhile, in Paris, guitarist Camel Zekri accompanied two members of Sensorband. The sounds of guitar Zekri were taken and sent to New York to be processed, and returned to Paris. Bert Bongers, An Interview with Sensorband, Computer Music Journal, Vol. 22 , 1998.